Accurately described as what every geeks needs for their breakfast rituals, the waffle type writer sure seems to be a cut above any regular waffle irons. Chris Dimino focused his creative energy around one simple problem: Giving new life to an obsolete product. In this case, an old type writer. 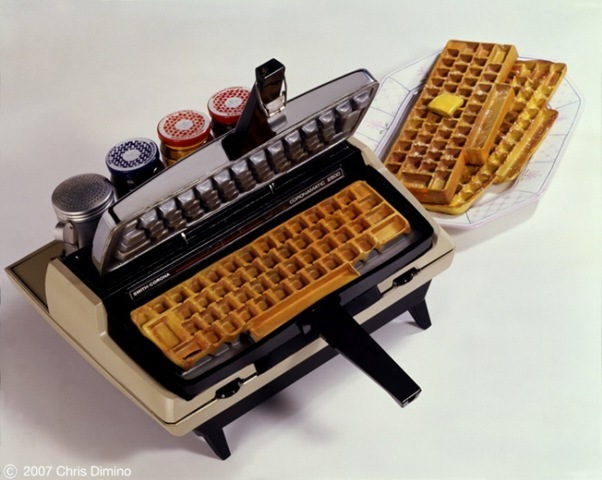 He came up with the brilliant idea of transforming and Corono Matic type writer into a waffle iron. Not just any waffle iron, mind you; one that makes key board shaped waffles! The type writer turned waffle iron has been featured in a few exhibitions, including the Next Best Ding, a traveling exhibit all about re-invention of the type writer; as well as part of a group exhibit for the School of Visual Arts based around the concept of taking an obsolete product and giving it a completely new function by minimally modifying it. Chris could have done what so many other designers did: Completely melt the type writer down and use the raw materials to build some thing else. Instead he cleverly recycled the “obsolete” item into a new stand alone product. From a food related angle, it is good to see that the “keys” are so deep. I don’t consider myself a waffle fundi, but I do enjoy a good waffle every now and then, and even I can see that those keys are gonna be like little pockets of heaven. It all comes down to syrup retention… Nice deep pockets for syrup to accumulate in. Sure, the keyboard might look more realistic when flipped over, but we all know: waffles are all about how much syrup and cream or ice cream you can fit on it. On a more serious note, however fun it could be to make keyboard shaped waffles at home, I’m afraid it might constantly remind me of work. Going home after a long day of work, I usually switch my laptop on any way to either surf the web, write a few articles, or do design work. Eating a keyboard shaped waffle while having to work on a keyboard all day might be over kill. Still it does not dismiss the fact that this is one of the most original designs I’ve seen all year. For other kitchen related brilliance, why not check out the La Cimbali and Faema Coffee Machine Concepts that Invigorate the Eyes and the Body or Cake Tin Set in the Shape of a Gigantic Cookie.